PARIS (NASA PR) — Data from NASA’s Cassini spacecraft has revealed what appear to be giant dust storms in equatorial regions of Saturn’s moon Titan. The discovery, described in a paper published on Sept. 24 in Nature Geoscience, makes Titan the third Solar System body, in addition to Earth and Mars, where dust storms have been observed. The observation is helping scientists to better understand the fascinating and dynamic environment of Saturn’s largest moon. Titan is an intriguing world — in ways quite similar to Earth. In fact, it is the only moon in the Solar System with a substantial atmosphere and the only celestial body other than our planet where stable bodies of surface liquid are known to still exist. There is one big difference, though: On Earth such rivers, lakes and seas are filled with water, while on Titan it is primarily methane and ethane that flows through these liquid reservoirs. In this unique cycle, the hydrocarbon molecules evaporate, condense into clouds and rain back onto the ground. 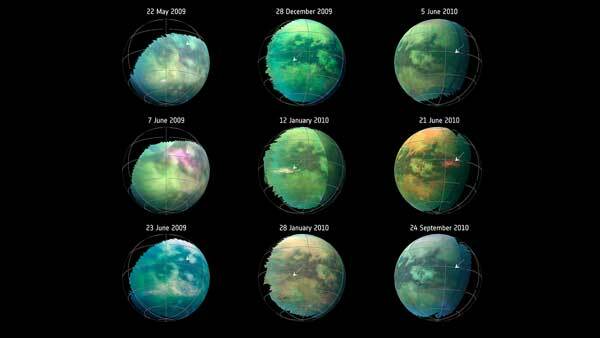 The weather on Titan varies from season to season as well, just as it does on Earth. In particular, around the equinox — the time when the Sun crosses Titan’s equator — massive clouds can form in tropical regions and cause powerful methane storms. Cassini observed such storms during several of its Titan flybys. When Rodriguez and his team first spotted three unusual equatorial brightenings in infrared images taken by Cassini around the moon’s 2009 northern equinox, they thought they might be the same kind of methane clouds; however, an investigation revealed they were something completely different. The researchers were also able to rule out that the features were actually on the surface of Titan in the form of frozen methane rain or icy lavas. Such surface spots would have a different chemical signature and would remain visible for much longer than the bright features in this study, which were visible for only 11 hours to five weeks. In addition, modeling showed that the features must be atmospheric but still close to the surface — most likely forming a very thin layer of tiny solid organic particles. Since they were located right over the dune fields around Titan’s equator, the only remaining explanation was that the spots were actually clouds of dust raised from the dunes. Organic dust is formed when organic molecules, formed from the interaction of sunlight with methane, grow large enough to fall to the surface. 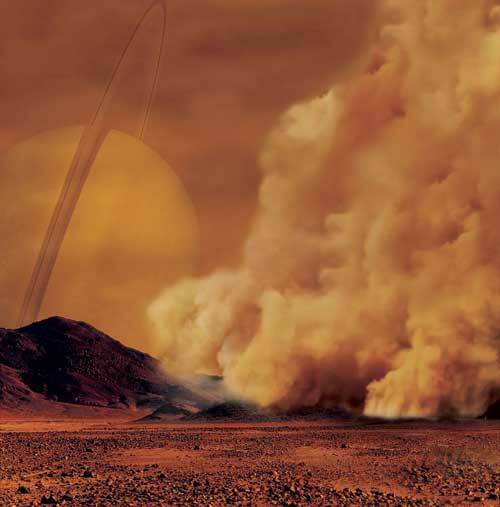 Rodriguez said that while this is the first-ever observation of a dust storm on Titan, the finding is not surprising. The existence of such strong winds generating massive dust storms implies that the underlying sand can be set in motion, too, and that the giant dunes covering Titan’s equatorial regions are still active and continually changing. The winds could be transporting the dust raised from the dunes across large distances, contributing to the global cycle of organic dust on Titan and causing similar effects to those that can be observed on Earth and Mars. The results were obtained with Cassini’s Visual and Infrared Mapping Spectrometer. The Cassini-Huygens mission is a cooperative project of NASA, ESA (European Space Agency) and the Italian Space Agency. NASA’s Jet Propulsion Laboratory, a division of Caltech in Pasadena, California, manages the mission for NASA’s Science Mission Directorate in Washington. The Cassini spacecraft deliberately plunged into Saturn on Sept. 15, 2017. JPL designed, developed and assembled the Cassini orbiter. The radar instrument was built by JPL and the Italian Space Agency, working with team members from the U.S. and several European countries. Yeah it’s Earth like, it’s like a oil refinery on Earth :). Shouldn’t be surprising. If a world has an atmosphere and there is no vegetation, regional and global dust storms should be expected. How they impact exploration will be a function of the density of the atmosphere and the strength of the electrical discharges that will accompany them from the dust blowing around. Titan is a special place and when we have fusion power plants that only weigh in at a few tons we’ll go there with people. For all the special qualities that Titan has on it’s surface what planetary scientists theorize lies below is just as interesting. There’s a sub Titanian ocean of water down below that very special surface and atmosphere. At least some have reason to think so. If so, what special world that bridges the cryosphere with the water zone of the solar system. Titan is a very special world. Yes, wouldn’t it be great to have a station in orbit over it with researchers running rovers and submarines on it? what do you mean by “correct gravity”? but without the massive pressure part, which is what makes EVA and lunar/mars ops very difficult. I suspect the perpetual extremely cold temperature on Titan would be a bigger obstacle than the lack of pressure combined with relatively benign daytime temperatures on Mars. Particularly if mechanical counter-pressure spacesuits (recall Dava Newman) come to fruition. That will happen. It’ll be 100+ years probably, but it will happen.